I’ve been in the classroom teaching US History for nearly 30 years. While we have lessons to teach, there is a constant lesson I believe is necessary, essential rather, for students and teachers to learn and remember. Patriotism has been under assault. Some people do not even know what it even means anymore. I’ve been lucky. Patriotism, I believe, is gratitude pure and simple. We need to be thankful to those who have protected and sacrificed for our freedom over the generations. From overmatched rebels at Lexington who stood up to tyranny and won a nation, to citizen patriots who fought back on Flight 93 to stop evil in transit. We must remember. We must listen; we must be willing to hear as well. I was taught from a young age by my, WWII and Korean War veteran father that it takes more than rope to keep our flag flying. I started asking questions of my dad and his friends about their time in WWII and the powerful and emotional testimonies they shared with me were overwhelming. What I learned was that these “Band of Brothers” weren’t really fighting for the nation. They were fighting for each other. Sacrifice and devotion in combat is an intensely personal act. It defies any definition and words just do not explain it all. So how do you translate that sacrifice to students in classrooms that desperately need lessons in gratitude, duty, honor, and country? 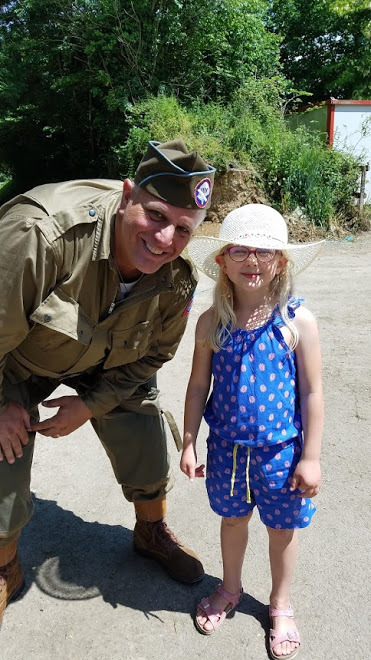 You introduce them to the men and women who served our nation and have them learn and listen. Twenty-four years ago, an idea was born and has transformed thousands of lives of students and veterans alike – year after year. For the last twenty-four years, my students and I have hosted a Veterans Appreciation Dinner. Students work hard to raise funds to pay for a dinner honoring the service of our veterans. Initially, the first dinner had 50 veterans in attendance. Now we have nearly 1,500 veterans that come. Somehow through the power of faith and teamwork, we annually raise $15,000 a year to host this dinner. It is amazing to see 60-80 Eighth-grade students raising this amount, but we do it. We love our veterans and they love us back. I always introduce the evening by asking the veterans to be the teachers to the students serving their meals. They were there, we weren’t. Sometimes the students can even save a life. One night at our dinner years ago, I noticed a veteran sitting off to the side of the event stage just watching. I went over to him to ask him to join us. He said, “no, he was just watching.” I could tell he was struggling, I could tell he felt out of place. He was about twenty-five years old and must have served in Afghanistan or Iraq. So I sent Emilee and Kylie to talk to him and to help get him to a table. They did. I told him I couldn’t tell him that. I was worried that he was suffering from PTSD in some way… and he was. He just wanted to thank them. I couldn’t allow that, but I did tell the kids they were amazing. A few years later I was visiting a VA clinic for a speaking event and sitting in the waiting room was this veteran who was completing his counseling session and he jumped up and hugged me. He was a new man. He asked if I could let Emilee and Kylie know he was alive because of them and that he wanted to invite them to his upcoming wedding! I was in tears and said okay. I knew that we had a Veterans Day event coming up at our local high school and asked if we could do something special. We assembled nearly 2,000 students and they heard the stories of these two remarkable young women who on a special Veterans’ Dinner Night listened, loved, and showed mercy that comes through a pure heart. I asked the girls to come to the stage where he presented them with two bouquets of roses and an invitation to be in his wedding party. They and their families attended and now years later, he has two kids and they are in my class. The power to serve, the power of this dinner is transformative. Patriotism is gratitude in action, may we always remember that. And it can simply start by sharing a meal. 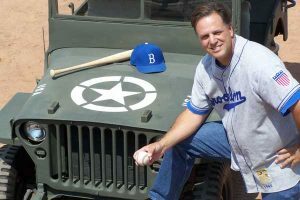 Todd is the son of WWII/Korean War veteran Wallace P. Anton, author of “No Greater Love: Life Stories From the Men Who Saved Baseball” and “When Baseball Went to War”, and a 28 year veteran US History teacher. Working closely with students and WWII Veterans has earned him national recognition for an extensive oral history collection (nearly 5,000) he put together. He is a former board member of the National WWII Museum and the divisional historian for his late father’s unit, the 70th infantry division.